Since being pregnant I’ve had an obsession with loaded nachos and fries. Last month, while eating out somewhere (thanks to pregnancy brain I can’t remember where) my husband and I had bacon cheddar fries. They were loaded with cheese, bacon, and green onions and I could not get enough of them! After I inhaled the plate… (yes, I can admit I inhaled the plate of loaded fries) I proclaimed I would re-make these at home soon. As soon as a few of my favorite blog friends expressed interest in doing a “big game” appetizer blog hop I knew exactly what I was making… bacon cheddar fries! 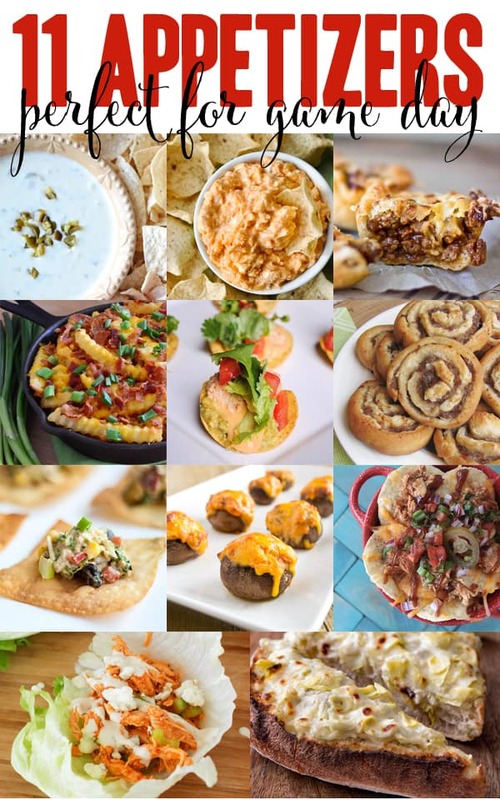 Just like in the past with our progressive dinner parties we are hosting a “big game” appetizer party… we all are bringing some tasty game-day recipes to the world today! I love football and what better thing to pair with football (other than beer which I currently can not have) is food! For my bacon cheddar fries recipe, I used Cabot Sharp Cheddar cheese and used a KitchenIQ™ hand grater to grate the block of cheese. I can’t say enough good things about both Cabot Cheese and KitchenIQ™! Both have stellar products that help me make delicious food. 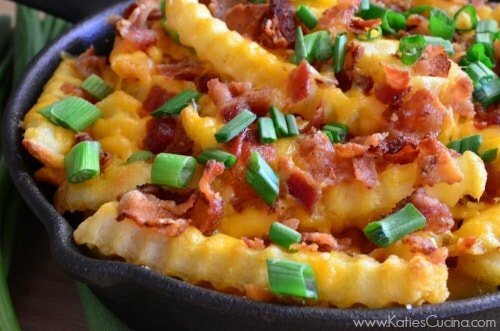 So if you’re looking for an easy recipe to whip up during the “big game” you should definitely make a batch of bacon cheddar fries! As a side note, you should have enough to serve two, so if you are entertaining for a large crowd you might want to double if not triple the recipe! Bake crinkle-cut fries according to package (about 20 minutes on 400 degrees). Salt and pepper after they are done baking. While fries are cooking, fry bacon. Remove from grease, allow to cool, and chop. 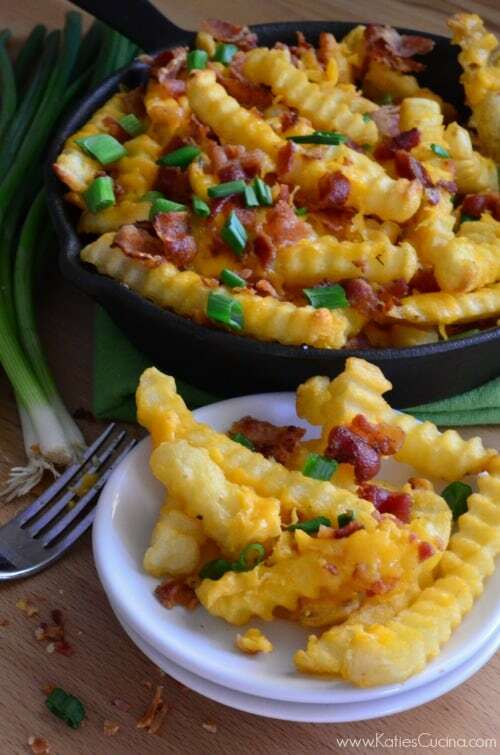 Layer fries in a small baking dish and top with shredded cheddar cheese, bacon, and green onions. Broil for 1-2 minutes until cheese is melted and bubbly! Now on to the prize pack… one amazing prize pack so you can entertain in style and watch the “big game” with your friends and family. 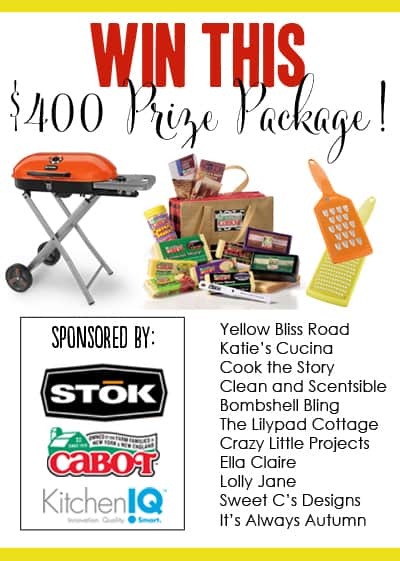 Enter to win a STOK GRIDIRON Portable Gas Grill, (1) $75 Cabot Gift Basket and up to ten (10) coupons for free Cabot Cheese (up to $3 at participating grocers), and a KitchenIQ™ prize pack that includes a Container Grater, Fine Grater, Coarse Grater, and Extra Coarse Grater. Overall retail value of the entire prize pack is $400! Must reside in the United States and be 18 years of age or older. Please wait for the rafflecopter widget to load (if it doesn’t click on the link). Must enter mandatory entry to be eligible to win. One winner will be chosen at random. Giveaway ends Sunday, January 19, at 11:59 pm EST. Disclaimer: We did not receive anything in exchange for the prizes for the giveaway. As always all opinions are our own. Thank you for offering this fabulous prize! Good luck to all entrants!! Way too easy – why have I never thought of doing this?? Buying frozen fries TODAY!! It’s been my thing lately, Kristin! I think I need to buy stock in french fries right now! lol. You had me at BACON! These look so yummy! Ha ha… well these are super easy to make he can totally make them! Yum! Fast and flavorful, my kinda recipe! Looks tasty!! Mine too! 🙂 At least now a days its all about fast and easy recipes! Sign me up! I want these right now! Ha ha thanks Autumn! They are so good! 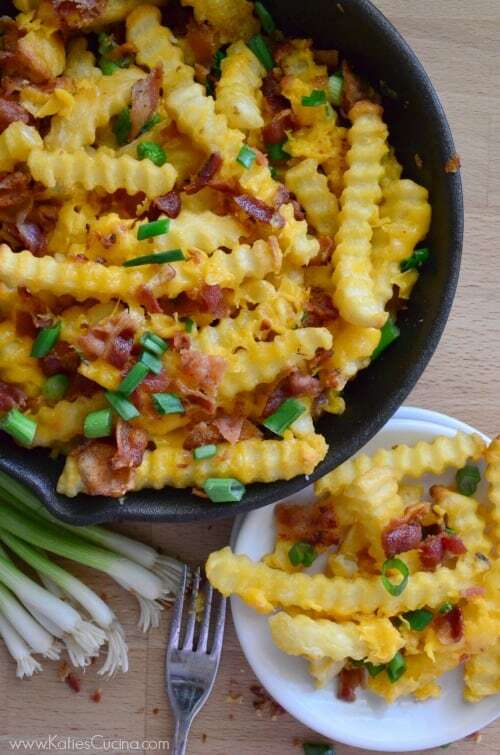 Love everything about these fries! So good! 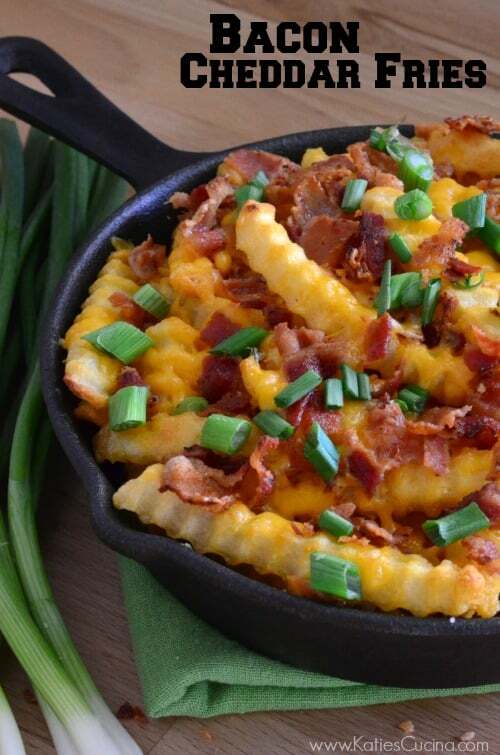 I love loaded fries too. I’ve never thought of making them at home though >Very cool. Christine–it’s an easy semi-homemade game day snack! Ha ha… Danielle I’m all over the book! I crave new things daily. holy moly these look amazingly delicious! Any type of loaded fries at this point is a good fry in my book! My store carries a variety of sizes for the crinkle cut fries. What size bag does this recipe reference? I used a 32 oz bag. Happy cooking! These would be great with a side of ranch or sour cream .. Just to add to the loveliness ! We love these and call them “Irish Nachos”. Thanks for posting, we eat them out and I wasn’t sure how to make it at home. I never thought about frozen fries. Thanks for stopping by Kathy! Yes–they are so good and yet so easy to make!!! Could I use Cabot Xtra sharp instead? Peter, of course! 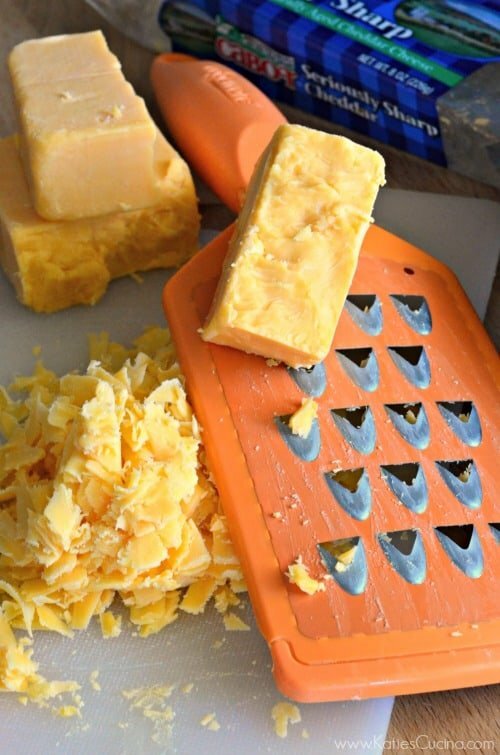 Use whatever cheese you have on hand! Hi Stevie, Thank you for taking the time to leave a comment. Most Americans love the bacon-cheddar combo. Honestly, anything bacon. I like to provide a wide variety of recipes for cooks of all level. I want readers to feel like they can make recipes regardless if it includes homemade french fries or store-bought. Either way it’s a delicious recipe. Pingback: Because Everything Tastes Better with Bacon!